This picture combines three of my favorite photo subjects: yard art, sunset, and trees. 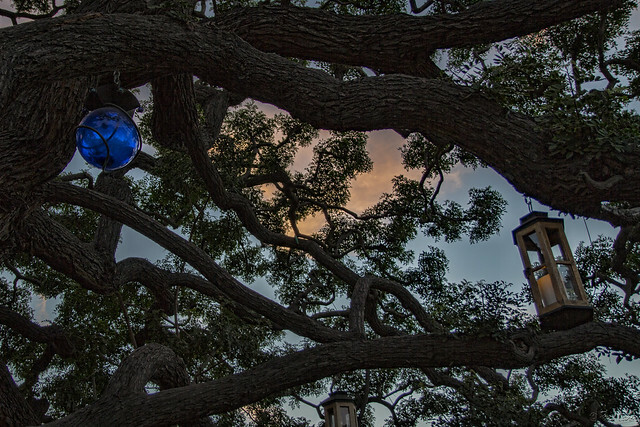 Many of these globes and lanterns hang from the lower branches of this tree. I imagine that once it's fully dark, the candles will give off a soft glow that's perfect for those sitting underneath. The tree is one of those wiggy tree types whose branches seem to squirm around everywhere—what I like to think of as a Medusa tree. The branches and leaves are airy enough to allow the sky with its pink sunset clouds to show through beautifully.